Movers Kamloops BC, fully equipped trucks, 1, 2, 5 ton trucks. 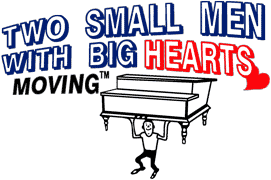 Piano skid, 4 wheeler dolly, 2 wheeler dolly, shrink wrap, tape, tools, mattress bags, moving pads. To meet the high expectations of the customer. To have happy, satisfied customers. Experienced in the art of moving. Fast, careful, kind, polite, courteous, and strong. "If it is important to you, it is important to us." "Our prices will move you!" Or type 1, 2 bedroom condo, or 1, 2 bedroom house. To prevent spam, please solve the following. Movers Kamloops: So very impressed with the care they put into moving my home. I couldn't be happier. My husband and I have never used movers before and I'm so glad we picked Two small men with Big hearts. They moved us from our place in Monte Lake with 3 feet of snow on the ground to by the airport with no one problem. I was worried to have people I don't know move all my big heavy expensive solid wood furniture but I was very impressed. Would definitely use again and recommend this company to everyone. Movers Kamloops: Fantstic movers. The best I've ever used! It was nice to use movers who actually cared about my things. The workers were courteous and so helpful. The cost was way less than the last movers i used who didnt even put blankets on my furniture and they damaged a bunch of stuff. I will definitely recommend Kamloops Two Small Men With Big Hearts to my family and friends. You wont be disappointed! Movers Kamloops: From the original interview to the final box being moved in at our destination, we were comletely satisfied with the owner and crew. They were hard working courteous young men. Very efficient in placing everything and assembly as needed. They were very careful with our belongings nothing broken or damaged. I would highly recommend this company for your next move. Movers Kamloops: The duo of James and James were very professional, courteous and efficient. I noticed that they did take caution when lifting and moving. We had no damages to our personal items in the move. I would recommend these Two guys who did have big hearts. Excellent work!